Kindle debut coming soon! The books of the Hatshepsut Trilogy will soon be making their debut on Amazon Kindle. Featuring three beautiful new covers, this will be the first time the trilogy will be available (legally!) as e-books to readers in the US and UK. Watch this space! 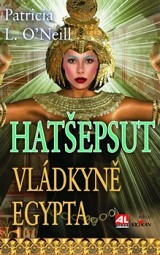 The Czech language version of The Eye of Re is now available as Hatšepsut Vl�dkyně Egypta (Hatshepsut Ruler of Egypt) from Alpress Publishers in the Czech Republic. The Czech language version of The Eye of Re will be published by Alpress and should be available in early 2014. 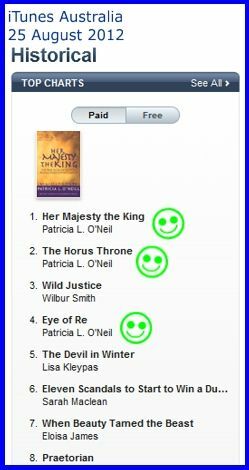 Her Majesty the King, The Horus Throne and The Eye of Re have chalked up over a year on the iTunes Australia historical fiction bestseller list. Thank you readers for your support and all your lovely comments! 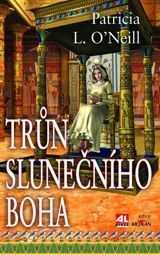 The Czech language version of The Horus Throne is now available as Trůn Slunečn�ho Boha (Throne of the Sun God) from Alpress Publishers in the Czech Republic. The Czech language edition of The Horus Throne will be published by Alpress Publishing and is due for release in September 2012. 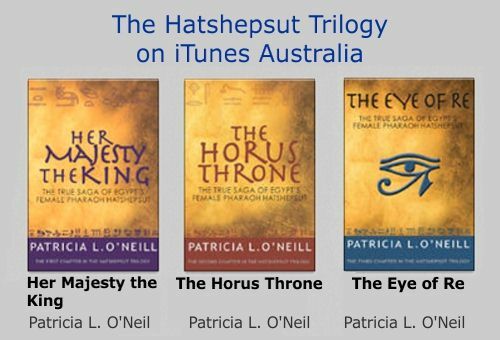 The books of The Hatshepsut Trilogy are now on sale as e-books on iTunes Australia. Within two days of their debut all three books were on the top-ten bestseller list in historical fiction. But watch out for the glitch—my name is spelled wrong in the iTunes listings. Find the books of The Hatshepsut Trilogy in iTunes Australia. Release date of Faraonka, the Czech language translation of Her Majesty the King, by Alpress, Czech Republic. Alpress Publishing, one of the largest publishers in the Czech Republic, will be publishing a Czech language version of Her Majesty the King in 2011. Release date for The Horus Throne, the second book of The Hatshepsut Trilogy. Release date for Her Majesty the King, the first book in the Hatshepsut Trilogy. Her Majesty the King is published by Gibbes Street, an imprint of New Holland Publishers, Sydney. Her Majesty the King wins first place in the New South Wales Writers� Centre & New Holland Publishers Genre Fiction Award, a nation-wide competition for all categories of genre fiction. Horses were not native to Egypt. The ancient Egyptians were introduced to horses and chariots in the most demoralising way possible—by being conquered by the Hyksos peoples of Canaan. But the Egyptians soon turned the tables on their oppressors. 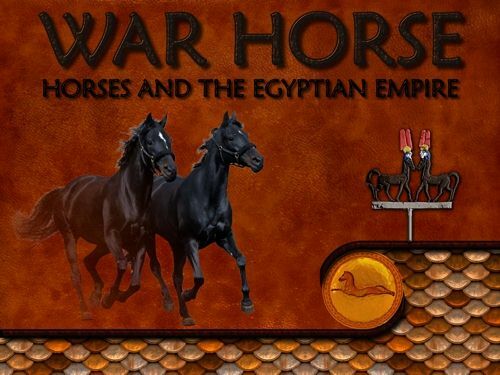 The Egyptians became such masters of horsemanship and chariot warfare that Egypt became the world's first superpower. Modern attempts to recreate and drive Egyptian-style chariots have demonstrated that horsemanship was the most important factor in military success. Of all the peoples of the ancient Middle East, the Egyptians forged the closest bonds with their equine friends. Some Egyptians even immortalised their beloved horses on the walls of their temples and tombs, including Hatshepsut and Senenmut, whose real horses were featured in The Hatshepsut Trilogy. Egyptians were the ancient world's greatest animal lovers. They kept cats, dogs, monkeys, geese and a wide assortment of unlikely critters as pets. 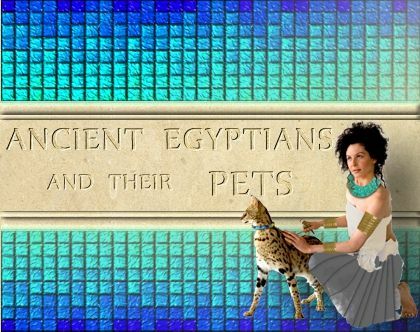 In this fun and lively talk by Ancient Egypt Society Executive and Hatshepsut Trilogy author, Dr. Patricia L. O'Neill, you'll hear how ancient Egyptians cared for their pets, named them, loved them in life and mourned them in death. We'll get to know some famous pet owners and take a look at the role animals played in symbolism and religion. And we'll find out whether cats really were worshipped as gods in ancient Egypt. The Ancient Egypt Society of WA Inc.
Patricia gave a lively illustrated talk about the loyal, talented men who helped Hatshepsut become one of ancient Egypt's greatest rulers. The audience heard about the heroes and villains who accompany Hatshepsut on her adventures in The Hatshepsut Trilogy, and how they were brought to life using the ancient evidence and a bit of psychological detective work. Patricia discussed Senenmut's relationship with Hatshepsut, and also explained how she cracked the mystery of Hatshepsut's persecution by Tuthmosis III. 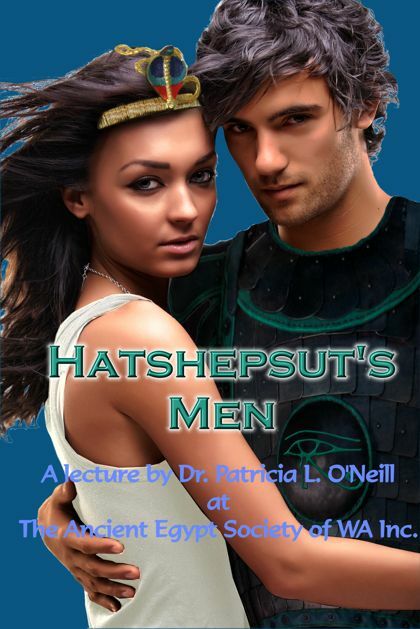 The audience was treated to Patricia's photographic recreations of some of the main characters in The Hatshepsut Trilogy (see the poster above for Hatshepsut and Senenmut.) She also inscribed copies of her latest novel, The Eye of Re, with an authentic hieroglyphic spell from Hatshepsut's mortuary temple at Deir el-Bahri. A badly damaged statue in the Manchester Museum (UK), which was once thought to represent a priest of Amen named 'Userhat', has recently been identified as belonging to Senenmut, Hatshepsut's chief advisor and lover. The statue's true identity was established when curator Campbell Price and Professor Rainer Hannig (University of Marburg) were inspecting the inscriptions on the statue. Professor Hannig noted that the hieroglyphs thought to be the owner's name could also be translated as 'the priest of Userhat-Amen.' This title referred to the man who was the overseer of the enormous state barge of Amen-Re. Only one man is known to have held that post—Senenmut. A damaged seated statue of Senenmut in the Manchester Museum, UK. The fragment is 48.5 cm tall. The statue's inscriptions state that it was 'given as a favour of the god's wife', which could refer to either Hatshepsut or her daughter, Neferure. Although the top of the statue is missing, its shape makes it likely that it once showed Senenmut holding Neferure on his lap, wrapped in his cloak. The sculpture was carved from pale indurated limestone, an unusual medium that was also used for the famous seated statue of Hatshepsut now on display at the Metropolitan Museum of Art in New York. The Manchester Museum statue was discovered in the vicinity of Hatshepsut's mortuary temple at Deir el Bahri sometime between 1894 and 1907. This statue brings the total number of statues attributed to Senenmut to twenty-six—more than any other ancient Egyptian non-royal person. Hatshepsut's temple at Deir el Bahri in modern Luxor, Egypt. A souvenir shop about one kilometre from Deir el Bahri was damaged by a fire, but Hatshepsut's famous mortuary temple was not threatened. Although the wooden shop building was destroyed and the blaze damaged adjacent shops and market stalls, the fire was contained before it could spread closer to the temple. Egyptian authorities stated that measures will be taken to protect the World Heritage-listed temple from similar hazards in the future. 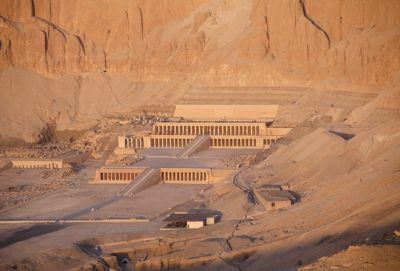 The 3,500 year old mortuary temple was built to commemorate Hatshepsut's memory and functioned as a major centre of worship during ancient religious festivals. A block from the reconstructed temple showing Hatshepsut as the God's Wife of Amen. Following her is her daughter, Neferure, shown as an adult although she was undoubtedly a child at the time the temple was built. A limestone temple originally constructed by Hatshepsut has been restored by French archaeologists from the CFEETK, and is now open to the public in Karnak's Open Air Museum. Most of the blocks of the temple were recovered from the Karnak Cachette Courtyard where they had been buried for millennia; they are decorated with reliefs of great beauty that are remarkably well preserved. 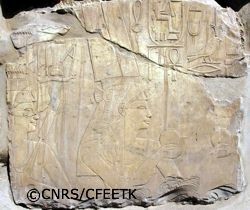 The temple, known as Netjery Menu (Divine of Monuments), features many scenes of Hatshepsut wearing the shuty crown of the God's Wife of Amen as she makes offerings to various gods. Kings Tuthmosis II and Tuthmosis III are also depicted, and there are several representations of Hatshepsut's daughter, Neferure. No one knows the original location of Netjery Menu within the Karnak Temple complex; the most likely site was east of the main sanctuary where Akh Menu, the festival temple of Tuthmosis III, now stands. Netjery Menu was one of several monuments erected by Hatshepsut for which Tuthmosis claimed the credit, after he began the persecution of the female Pharaoh. He later dismantled Netjery Menu to make way for Akh Menu. A rare wooden statue of a Pharaoh wearing the nemes headdress and shendyt kilt has been excavated at Abydos, the centre of the ancient Egyptian cult of Osiris. 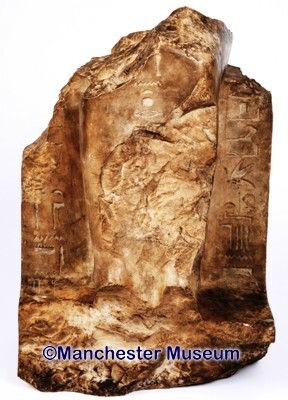 Professor Mary-Ann Pouls Wegner, head of a team of Egyptologists from the University of Toronto who discovered the statue, says the statue can be dated on stylistic grounds to the early Eighteenth Dynasty. Although the statue had been badly damaged by termites and no name is visible, its narrow waist and feminine facial features indicate that it probably represents Hatshepsut. The statue would have been carried in a sacred barque on the shoulders of priests during the annual Osiris festival to honour deceased kings. See a picture of the statue and read more here. Unfortunately, this news item is typical of the way that members of the public receive most of their information about ancient Egypt, and Hatshepsut in particular. The press release has not been followed up by publication of the results in a peer-reviewed scientific journal, so other scholars have no way of knowing exactly what the flask contained or even if it was authentic. The presence of what the press release calls 'nutmeg apple oil', which is possibly myristicin, makes one suspect that the contents might be a modern fake. A nutmeg apple is the fleshy fruit surrounding the pod of the nutmeg tree, Myristica fragrans. Nutmeg trees were only found on the Banda Islands in Indonesia until recent times; this spice was unknown to the ancient Egyptians. Until the precise chemical composition of the contents of the flask is published, there is no way to ascertain if the ingredients could or could not date to Hatshepsut's time. The contents should also be C14 dated for confirmation. The flask itself may be a modern forgery. A CAT scan (view here) clearly shows that the vessel was made in two parts, the neck and the base; the ancient Egyptians always made the bodies of stone flasks in a single piece. We do not know the concentration of the benzopyrenes present in the residue. Would the concentration have been high enough to cause cancer when the substance was applied to the skin? The benzopyrenes may simply be by-products of the degradation of the fatty acids in the residue in a hot, anoxic environment over thousands of years. They might also be incidental contaminants if the ancient methods employed to extract or prepare any of the ingredients used heat. Without the original data, we cannot say. Concluding that the residue could not have been a perfume because it was greasy is an uninformed judgement. All ancient Egyptian perfumes were fat or oil based. They were rubbed onto the body, clothing and wigs to moisturise and provide long-lasting scent. Comparing Hatshepsut to 'a greasy plate of ribs' is unprofessional and does nothing to assist our understanding of ancient Egyptian culture. Dr. H�veler-M�ller's assertion that Hatshepsut's family was afflicted with a skin disease is unproven. The small macules that occur on some Eighteenth Dynasty royal and noble mummies have never been properly investigated; no one really knows what they are. They not only occur on the neck and upper thorax of the mummies, but also in the hair of some. No known skin disease follows such a distribution. Many Egyptologists and forensic pathologists feel that the macules are more likely to be an artefact of the mummification process. Until a proper histopathological study of the macules is made and published, we cannot be sure of their significance. Dr. H�veler-M�ller's statement that Hatshepsut had cancer is also problematic. It depends on Dr. Zahi Hawass' claim that the mummy known as KV60A is Hatshepsut, and the interpretation of the pathology revealed on the mummy's CAT scan. Many Egyptologists have doubts about this mummy's identity (click here for more on this dispute). A National Geographic TV documentary reported on the CAT scanning of several royal and purportedly royal mummies, but none of the data has ever been released. Until the CAT scans, DNA analysis and morphometric data mentioned in the documentary are scrutinised by the scientific community, the validity of these claims cannot be evaluated. Virtually all the print and online media available about 'Hatshepsut's flask' and its contents are sourced verbatim from the University of Bonn press release. News material like this is prepared by publicists, not the scientists who have done the work. Press releases are often incomplete, sensationalised and dumbed-down. We can only hope that Dr. Wiedenfeld and Dr. H�veler-M�ller will soon publish a peer-reviewed account of their findings so the scientific community can give the flask and its contents the attention they deserve. King Tut comes to Melbourne—and Hatshepsut's parents are part of the show! The world-wide hit exhibition, 'Tutankhamun and the Golden Age of the Pharaohs' will be on show at The Melbourne Museum from 8 April 2011 to 6 November 2011. This is the last stop for the touring exhibition before its precious treasures head back home to Cairo. The exhibit contains a section featuring Egypt's Golden Age, the Eighteenth Dynasty, and includes objects from the reigns of the warrior Pharaohs who preceded Tutankhamun. Although there are no objects illustrating Hatshepsut in the exhibit, there is a charming small (69 cm) statue of her parents, King Tuthmosis I and Queen Ahmose. Seated between them is the king of the gods, Amen-Re—who has his arm around Queen Ahmose! It is highly likely that Hatshepsut herself ordered this statue to be made and placed in Karnak Temple to honour her parents. Unfortunately, this fine alabaster sculpture can't tell us much about the appearance of Hatshepsut's parents (although we know what they looked like from other sources). During the reign of Tutankhamun's father, the heretic Pharaoh Akhenaten, the statue was smashed during the attacks of Akhenaten's adherents. The top part of the statue containing the faces was completely destroyed. Later, during the reign of Tutankhamun, the statue was repaired. Amen-Re was made to look like Tutankamun, and King Tuthmosis and Queen Ahmose were given generic faces typical of the late Eighteenth Dynasty. Even so, Hatshepsut's tribute to her parents still has the power to convey the love she felt for them. The false door (place of offering to the dead) belonging to the tomb of User-amen, Vizier during the latter part of Hatshepsut's reign, was found buried in front of Karnak Temple. The large granite slab had been re-used as part of a wall built by the Romans. Residue inside a 3,500-year-old perfume flask belonging to Hatshepsut will be analysed in an attempt to replicate the fragrance of the world's first perfumista. Djehuty was an important official who was devoted to Hatshepsut. A team of Spanish Egyptologists have located the hidden burial chamber of his tomb and found a cache of gold jewellery, including several pairs of earrings. In a Discovery Channel documentary, Dr. Hawass claims that a broken tooth proves that an obese mummy known as KV60A is that of Hatshepsut. Mark Rose, Director of the Archaeological Institute of America, discusses the pitfalls of announcing discoveries on TV without proper scientific scrutiny.